» Last Week of Feb.
Posted by marcus on February 22, 2011; This entry is filed under News. 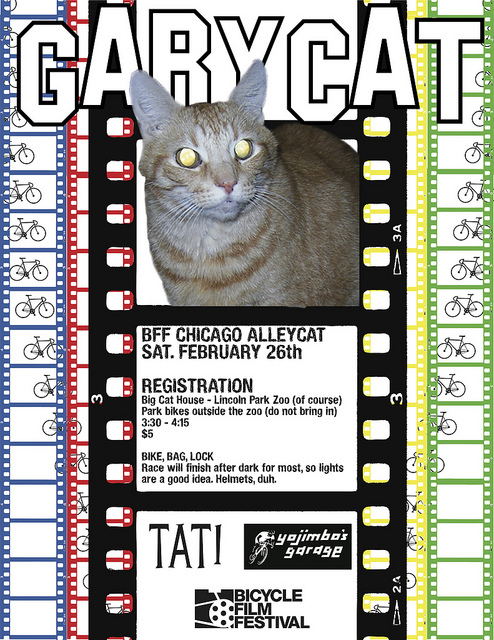 Thursday – Saturday: The Bicycle Film Festival is in town with films, parties and races all over tarnation (incorr. usage). Thursday – Saturday: Get out of town. The North American Handmade Bike Show is in Austin, TX. Flickr Tag Error: Call to display photo '5469220652' failed. If you visited Yojimbo’s Garage between 1999 and last year, you might have met Gary- the big, orange shop cat; he was a friend to everyone who walked through the door. Late last year Gary had some medical problems which caused his health to fail. After some time with his vet, he was more comfortable returning home. Gracie and myself were with him when he passed away early on the morning of 10 November. Gary the cat was born 5 August 1997 at the home of Kevin Tabitz, a customer of the shop, and moved into YG two years later. A little more information on Gary is on one of the shop’s old web pages. Very sorry to hear about Gary’s passing…he was a fantastic guy and appreciated his color selections that make your bikes really stand out!